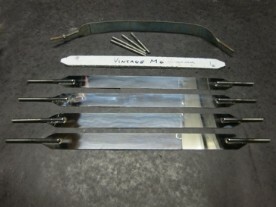 Vintage MG Parts were asked by a customer to manufacture a pair of L1 petrol tank straps. Similar to the in-house production of P and T Type petrol tank straps, these have been worked from an original factory L Type sample to reproduce a faithful replacement part in all its fine detail with the exception that these are produced in polished 2mm thickness stainless. We also stock petrol tank strap rubbers and Petrol Tank Straps for the P and T Type.